B O O T L E A D: The History being repeated as farce, and certainly with the sameruinous end for humanity. 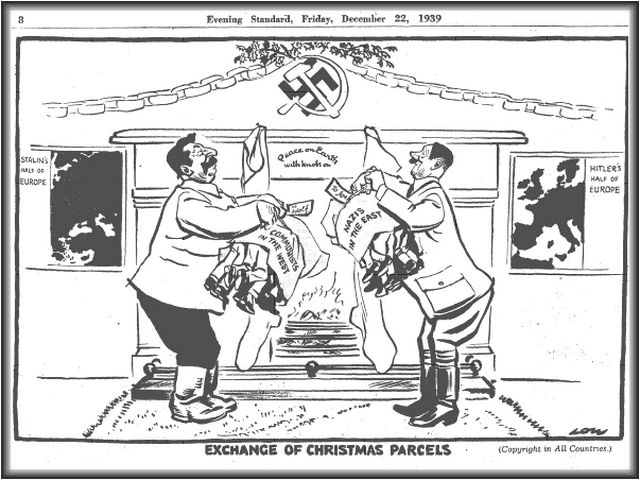 Figure: Cartoon by David Low, published by English tabloid "Evening Standard" on 22 December 1939. In an October 6 article titled "The German Question", STRATFOR's George Friedman poured a pitcher of cold logic on America's plan for NATO's future. It appears that Germany is determined to block NATO membership for Ukraine and Georgia. The long-term implications of this decision are stunning. "Since NATO operates on the basis of consensus," wrote Friedman, "any member nation can effectively block any candidate from NATO membership." The Russian invasion of Georgia has forced Germany into this position. The conflict in Georgia has forced the Germans to clarify their geopolitical thinking. What we see now, quite clearly, is Germany turning away from NATO. They can call it whatever they like. They are thinking as Germans. Russia's thrust into Georgia was a masterstroke because it successfully redirected Germany's political sensibility from a NATO-centered view to a German-centered view. In Europe there is one question that stands above all others, and the Germans must give the answer. Either Europe will confront Russia in a new Cold War, or Europe will become Russia's partner. According to Friedman's logic, Germany has already decided on partnership with Russia. Imagine a partnership between Russia and Germany. The Russians supply the military muscle, the natural resources, and cheap labor. The Germans supply the technology, the money, and European finesse. Friedman says that Germany's energy situation is "desperate," and that German leaders are merely looking after their country's national interest. It is important to remember, however, that Germany sees a carrot as well as a stick. The German leaders are not merely avoiding pain. They are tempted by a Russian partnership, especially as global financial structures are imploding. As Friedman points out, Germany's "political problem" is its geographical position in the center of Europe. Does Germany face east or west? Does Germany align itself with Russia or the Anglo-Americans and the French? But surely the German's understand that their destiny lies with the West! Such a conclusion, however, may be sensible to someone viewing affairs from a distance. It is not immediately sensible to the German leadership, tempted as they are by the prospect of a vital "reforming" role in Europe. The European Union is not functioning properly and the Euro may be headed for the ashcan of history. The NATO system, dominated so long by America, is increasingly inconvenient from the German point of view. It may, in fact, be a harebrained scheme to partner with the Kremlin – which prefers Asiatic methods. But such a partnership appeals to German vanity as well as to Germany's practical sense. The Russians value the Germans. The Russians whisper sweet nothings into Germany's ear. Russian Prime Minister Vladimir Putin is a fluent German speaker who even possesses German traits, sympathizes with German thinking, and thereby flatters German feeling. It is a complex case of seduction. How do the Germans feel, deep down, about Russia's intentions toward Georgia and Ukraine? The Germans are ready to think in terms of their own national interest. They are tempted to disregard NATO. Perhaps they are sick of being NATO's prisoner. After all, Germany was defeated in World War II and became trapped in the Cold War between Russia and America. This is not a situation that bears repeating. Conflict between Russia and NATO is not in Germany's national interest. Friendship with Russia holds promise – even if the promise is a false one. France and Britain are willing to challenge Russia's new aggressive stance. Germany doesn't want this at all. The United States seeks to bring Ukraine and Georgia into NATO. Germany doesn't want this at all. There is a serious rift in NATO. Will the Germans find a way out of NATO? Conventional wisdom supposes that this is unthinkable. Everyone knows Russia is dangerous. Partnering with Russia is like playing with fire. Sooner or later Germany is going to get burned. At the same time, however, recent events in Georgia have educated the Germans. Suddenly Germany is confronted with an unpleasant choice. "NATO," noted Friedman, "as an institution built to resist the Russians, is in an advanced state of decay. To resurrect it, the Germans would have to pay a steep economic price." Quite clearly, the Germans have already decided to abandon NATO's mission in pursuit of their own short-term economic interest. Where this will lead in the long-run is obvious. One day Russia and Germany will come to blows, and America isn't going to be around to help Germany. Perhaps the financial crash on Wall Street has underscored the future irrelevance of America for Germany. America is collapsing, after all. NATO is therefore in trouble. It may not exist much longer. The Russian's are shrewd in playing their diplomatic, economic and military cards. Luring the German's into partnership opens the way to NATO's destruction by diplomatic means. "NATO has no real military power to project to the east," wrote Friedman, "and none can be created without a major German effort, which is not forthcoming." The logic of Friedman's analysis cannot be disputed. The Kremlin looks at the collapse on Wall Street and sees an opportunity. During an October 2 joint press conference with German Chancellor Angela Merkel, Russian President Dmitri Medvedev said, "One of the complicated issues we discussed was the financial crisis. We have realized once again that the current global financial security system, like the international security system, doesn't satisfy present needs. The flaws in the economic … model pursued by the United States of America … are serious, and we are paying for this today." In a speech before the Russian-German Public Forum, the Russian president translated today's financial crisis into geopolitical language. "What have recent events shown?" he asked. "They have demonstrated that the time in which one economy and one currency dominated the globe is irretrievably gone. And we need collective solutions to resolve the financial crisis brought on by financial selfishness…." In other words, let the Americans suffer their fate. Europe is face-to-face with Russia now. Does Europe want to oppose Russia on its own? The Russians are forcing Germany to make a decision. "It is possible that today some people would like to go back to the primitive division of the world into ours and theirs, right and wrong, but in Russia we are convinced that this time is irretrievably gone. It is impossible to revive the Berlin Wall, just as it is impossible to return to the Cold War – there is no reason to do so." President Medvedev is winking at the Germans. You know what to do, he says to them. You don't want to fight us. You need us. The wickedness of the KGB cabal in Moscow is not the issue. One must look "beyond good and evil," to the hard realities of the situation. Does Germany want to feel the chill of winter, without the benefits of Russian oil or Russian natural gas? This is not a sensible position, and Germany knows which way to turn. NATO is finished and America is going to collapse. Therefore Europe needs a new "security architecture." In other words, Europe now belongs to Russia and the Germans should cut a deal while the Russians are in a generous mood. If the French Prime Minister says that the world stands on the "edge of the abyss," the monster at the bottom of the abyss is Russia. The History being repeated as farce, and certainly with the same ruinous end for humanity.